Some weeks ago a faithful reader of our travel guides very gently “scolded us” for having reserved a nice long article to the Grotte del Vento (Wind Caves) in Garfagnana, forgetting the equally fascinating caves of the Antro del Corchia, also located in the province of Lucca but just a little bit further north. We really appreciated the advice and passion offered by Arianna Menconi, which has both inspired us to continue making our guide grow to become more complete while also making our curiosity grow about the peculiarities of the Antro del Corchia so much that we deepened our knowledge on the natural system of caves in the Upper Versilia. “So I visited the cave three times and each time I have to say I am convinced that this is one of the most beautiful caves in all of Italy. The visit to the caves takes about 2 hours, you can park in the town square and reach the entry with the appropriate bus. The ticket office for the entry tickets is located in the center of the village behind the church. 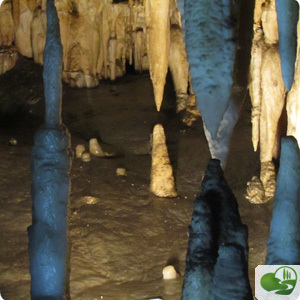 The cultural association which runs and promotes the cave “Corchia Underground” and includes, in addition, to the karst cave (Grotto), the Levigliani Silver Mines and the museum system of Levigliani. The ticket only cost 13 euros for the cave, while with the cumulative entry ticket (16 euros) you can visit both the cave and the mines. The visit to the Museum is included in the price of either ticket. 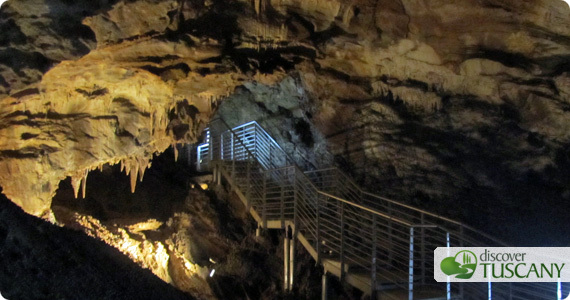 The Antro del Corchia cave is the largest in Italy, about 60 km of underground tunnels. It was discovered on October 11, 1840 by Emilio Simi and was open to the public in 2001. The route is about 2 km and is distributed on steel walkways which include a number of steps, but reasonable! The system is well organized and the staff has always been very kind to us. The most amazing part of the cave is without a doubt the last one, called l’Anello (the Ring) with a lot of stalactites and stalagmites, really spectacular! The Mercury Mines are unique as they are the only ones in Italy to have mercury in its native state. Practically you can see the mercury leaking into liquid droplets directly from the rock and this is a very rare feature in the world. The tour lasts about 40 minutes. So a few weeks ago we finally had the perfect chance to personally resolve the unintentional “gap” on our travel guides: a wonderful day trip took us to the discovery of the Antro del Corchia, no doubt one of the incredible little gems of Tuscany offers and worth highlighting! We highly recommend you to take a few minutes and immerse yourself in the reading of our interesting new article dedicated to the Antro del Corchia. We hope you enjoy it! Florence is Dressing in Blue: 27 Hours of Non-stop Events! Gelato Lovers? Welcome to Paradise!